Malmsten has chosen to be a sponsor of Team Rynkeby – God Morgon, the largest charity project in the Nordic region, which annually collects money for children with cancer and their families. Team Rynkeby – God Morgon organizes bicycle teams who jointly ride down to Paris, about 1200 km. The project was founded in Denmark in 2002 and has been constantly growing. 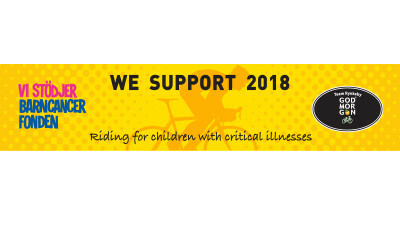 Today, 1900 cyclists, all dressed in yellow with yellow bicycles, and 450 functionaries participate in 48 teams from Sweden, Denmark, Finland, Norway, the Faroe Islands and Iceland. In 2017, Team Rynkeby - Good Morning donated approximately 8 million Euro to the fight against childhood cancer - of which approximately 2.5 million Euro was awarded to the Children's Cancer Fund in Sweden. We at Malmsten are proud to support the fight against serious diseases that affect children and wish our local Kristianstad team good luck.